Agent Good morning. Can I help you? Customer Yes, I'd like to get some information about trips to New Zealand. Agent Certainly. Take a seat and I'll be right with you. Agent Now, where would you like to go in New Zealand? Customer Well, I was hoping to do a bit of travelling around, actually. There are a few things I'd like to see and do before ! go back home. Customer One thing I really want to do is go to Christchurch. I have relatives living there that I can stay with - my mother's cousin - and I've heard it's a nice place. Agent Yes, it's a lovely city. And staying with relatives will help with the budget, of course. Agent It will save you some money. Customer Oh right! Well, I'm not too worried about that. I've saved quite a bit of money working in Australia. Agent Oh, that's nice. Good for you! 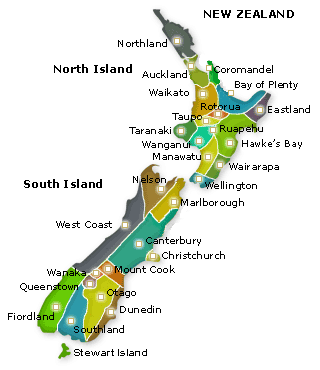 Well, you know that New Zealand consists of two main islands, the North Island and the South Island, and Christchurch is on the South Island. Customer Is it? I was never very goad at geography at school! Da you have a map I could look at? Agent Sure! Here we are. Customer Right. I see. And... well... then I'd also like to spend some time in Auckland. And maybe I could do an English language course there. Can you organise that sort of thing for me? Agent Certainly. We'd be happy to arrange that. But bear in mind that Auckland is in the North Island. Customer OK. And I'd also like to do some skiing or maybe even some snowboarding. I hear New Zealand is a great place forthat. Agent Yes, absolutely. But you should go to Auckland first for your studies, and then you can get the ferry across to the South Island and take the bus down to the snow. Customer Oh, I don't like boats very much. I'm not much of a sailor. I think I'd prefer to fly. Agent Right. What about joining a walking tour? That could be really fun. Customer Not sure about walking, but joining a tour might be a good way to travel, because then I might make some friends my own age. Agent Now, let's get some details. Can I have your name, please. Customer Yes, it's Su Ming Lee, but you can call me Sue. Agent OK, Sue. And what's your address here in Melbourne? Customer I'm living with my aunt in the suburb of Kew. It's 29 Loch Street. That's L O C H not L O C K.
Agent Do you have a phone number that I can get you on? Customer The best thing would be if I give you my mobile. I always have it on me. It's 0 4 0 2 double 5 8 double 92. Agent OK. And when do you want to travel? Because you'll need to be dawn south in July or August. Agent Yes, Let's say departing from Melbourne on the first of May - that's a Saturday - and then you could begin your course an Monday the third. Agent And how long would you like to study for? A month, two, three? What do you think? Customer Well, I'll probably need more than a month. What about eight weeks... until the end of June. Agent Fine. I'll see what I can do. Oh, and how would you like to pay for this? Customer On my Visa card if that's possible. Agent Hello Sue. It's Angelo from Kosmos Travel here. I've booked your flight and I've found you an English college called The Harbour Language Centre. Customer Great! Where exactly is that? Agent Well, have you got that little map I gave you yesterday? Agent You see where the harbour is, with the three wharves and the water? Agent OK, there are two parallel streets - Quay Street, that's Q U A Y and Customs Street. 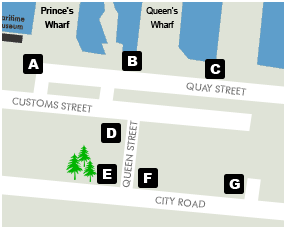 The building where the college is located is on Quay Street, opposite Princes Wharf. Customer Right, got it. And what about accommodation? Agent Well, I've booked you into a hotel for the first three nights and then the accommodation officer will find you a family to live with. Customer Good. And where's the hotel? Agent It's a short walk from the college, on the corner of Queen Street and City Raod. Agent On the left-hand side as we are looking at the map. Customer OK. Near the little park. Customer And what about a good bookshop? I'm going to need to buy a dictionary and some English books. Agent Yes. Well, I believe there's a really good language bookshop on the corner of Customs Street and Queen Street. It's near the college so that's pretty convenient. Customer Thank you so much. You've been really helpful. Complete the details below using NO MORE THAN THREE WORDS AND/OR A NUMBER for each answer. First you have some time to look at Questions 1-3. You will see that there is an example which has been done for you. So the first activity, visit family has been checked. Which THREE other activities does the customer want to do? What information are we listening for? If we need to understand a diagram or follow a map, we are usually trying to find out where things are, what something is made of or how it works. We may be listening for places, buildings, names of parts or stages in a process. What cues can we use to help get the right answers? Certain words are included to guide you. These may be things like compass points, left and right, expressions of position and place, verbs and adjectives of size, shape, quality, etc. Write the correct letter A-G next to questions 8-10.